Located at the back of the internal auditory canal, Scarpa’s ganglion, formed by cell bodies of the vestibular nerve, has an upper and a lower part. The bipolar neurons from the upper part stimulate the ampullary crestas of the superior and external semi-circular canals, the utricular macula, and a part of the saccular macula. Those of the lower part stimulate the ampullary crest of the posterior semi-circular canal a well as a part of the saccular macula. The nerve fibres of the sensory organs of the vestibular apparatus form the vestibular nerve that crosses the internal auditory canal and penetrates the brain stem at the level of the bulb where it connects to the vestibular nuclei. There are numerous connections between the different parts of the vestibular nucleus, which explains the complex nature of providing a network diagnosis of balance disorders. There are in effect internuclear, vestibulo-spinal, vestibulo-cerebellar and vestibulo-ocular connections, in addition to thalamic and cortical connections. The vascularization of the inner ear is primarily dependent on the vertebro-basilar system. This is the starting point of the middle cerebellar artery, which supplies blood to the labyrinth via the internal auditory artery. The internal auditory artery is divided into the anterior vestibular artery and the cochlear artery. The cochlear artery in turn is divided into the cochlear artery itself and the vestibulo-cochlear artery. The utricular macula, a part of the saccula, the ampullae and the membranous walls of the superior and exterior semi-circular canals as well as the roof of the utricle and the saccule are dependent on the anterior vestibular artery. 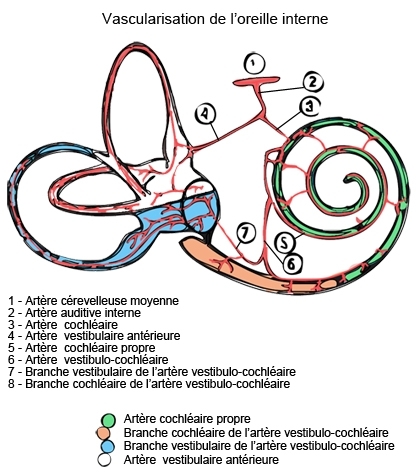 The cochlear artery supplies blood to the upper three-quarters of the cochlea while the vestibulo-cochlear artery supplies blood to the remaining quarter, the cochlear branch. 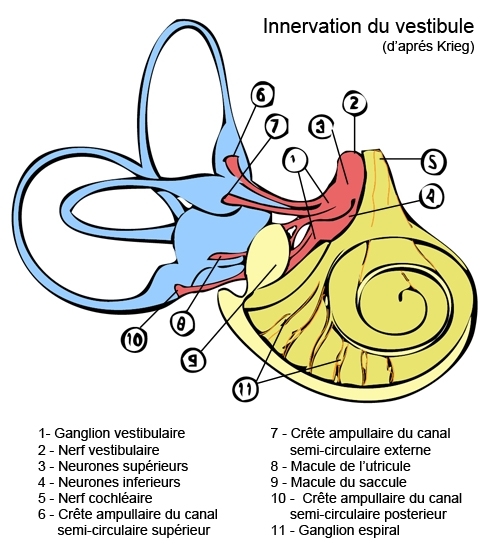 The vestibular branch of the vestibulo-cochlear artery vascularises the saccular macula, the floor of the utricle and saccule, the ampulla as well as the membranous walls of the posterior semi-circular canal. The absence of substitution explains why any vascular damage is the source of vestibular lesions, which, depending on where the lesion occurs, will manifest as hearing problems and/or balance disorders.